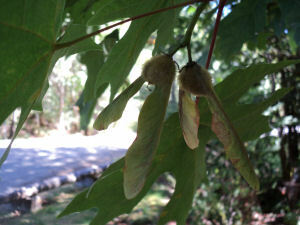 Young Shoots, Seeds, Flowers, Inner Bark, Sap Fibre/Wood "Four-barks medicine"
"Acer macrophyllum is a deciduous Tree growing to 30 m (98ft) by 12 m (39ft) at a fast rate. Sap started flowing right after tapping on November 17, increased between December 4 and 7, continued to flow intermittently at a somewhat lower level through January 21, then tapered off rapidly in late January in spite of apparently favorable sugar weather.... New tapholes tapped February 8 began to flow immediately and the sap volumes measured for the February 8-11 period were the highest of the season. This was followed by several heavy flows through March 8." 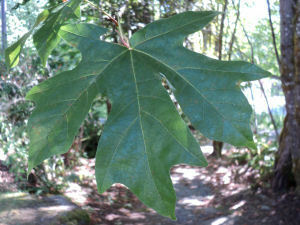 The new trees tapped January 18 produced high sap flows January 18-21 and February l-11 (fig. 4). Flows from all trees tapered off in mid-March and only a trace of sap flowed after March 22. Bud bursting was about March 29." Lans et al., 2007 - Ethnoveterinary medicines used for ruminants in British Columbia, Canada, Cheryl Lans, Nancy Turner, Tonya Khan, Gerhard Brauer and Willi Boepple, Journal of Ethnobiology and Ethnomedicine 2007, 3:11 doi:10.1186/1746-4269-3-11, 2007 Lans et al; licensee BioMed Central Ltd.
Ruth et al.,1972 - MAPLE SIRUP PRODUCTiON FROM BIGLEAF MAPLE, Robert H. Ruth, J. Clyde Underwood, Clark E. Smith, and Hoya Y. Yang, June 1972, Forest Service, U.S. Dept. of Agriculture, Portland OR. Turner1990 - Contemporary Use of Bark for Medicine by Two Salishan Native Elders of Southeast Vancouver Island, Canada, Nancy J. Turner and Richard J. Hebda, Journal of Ethnopharmacology, 29 (1990) 59-72, Elsevier Scientific Publishers Ireland Ltd.